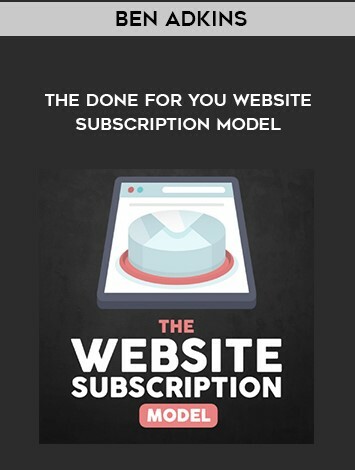 Ben Adkins - The Website Subscription Model(JulyUP 2018) | Free eBooks Download - EBOOKEE! Posted on 2018-07-18, by fubber. Ready to Build a Recurring Income Generating Business in the Next 90 Days? You get stuck trying to use expensive and complicated membership software (you don't need it despite what some guru, who was probably selling the software, might have told you). You try to build a subscription program in a niche that just isn't right for recurring revenue (not all niches work with Subscriptions and Memberships). You think you have to continue to create new content month after month to continue feeding your subscription or membership program and satisfy your subscribers (you don't and you shouldn't). Are you stuck because you've been trying to build a membership or subscription program and have run into one (or all) of the 3 Roadblocks above? I'm not someone who just teaches a concept. I test it and refine it so that I can show you something that really works. I'm going to take you behind the scenes of an actual subscription program that follows this exact model (it's done pretty well for us). Just seeing the "guts" of this is enough to help you put together your first successful subscription program. The "10,000 ft View" of the Subscription Model I Use and how it works. You're going to get a full view of how the "Snap on" Model works and how it blends a ton of things that you've probably heard about as you've waded through the online space... but puts them together in a model that ACTUALLY WORKS. Yes... You can do this even if you've never gotten it right before. The Real Reason Why You Don't Need Membership Site Software. Fact: Until you're making over 50k a month online, you don't need expensive membership software. I'll show you how to do everything with a few easy to build webpages, an autoresponder, and your favorite shopping cart. The Shocking Reason why you Should Only Create a Defined of Content for your Membership Site and then Stop... and Never Start Again. If you really want to build something that makes you money month after month, you need to get it out of your head that you need to keep creating content every month. That may sound odd, but you'll see exactly why on the inside. How to Build a Subscription on the "Psychology of Collecting". This is the core of why our Subscription Programs are so "sticky". Once you understand how this works, you'll be able to build subscriptions that get people to stick once they're in. Face it. Not all audiences are built for subscription programs. Stop trying to force a Subscription Program on folks that won't sign up and just let me show you the exact audiences that will. This is the core of everything. Once I show you the right audiences to target, you'll just need to know what type of content they will pay you over and over again for. I'll show you inside. You'll see how to create everything that makes the membership work. You can build this stuff no matter what your preferred page maker. (Wordpress, HTML, Clickfunnels, Leadpages, etc. all work) NO MEMBERSHIP SOFTWARE NEEDED. I can't say a lot here... Just know that this is the Secret Sauce that you add on once you get everything built. You've probably seen me using this stuff in my own business but you may have missed how it all works together. This is my favorite part of the Snap on Model. When you build things the way that I'm going to show you inside, you'll actually be creating 3 things at once. One to build a targeted list (who you can sell to later), One to Build a Monthly Income, and One Asset that you can sell for a nice one time fee. Put them all together and that's when the magic happens. No comments for "Ben Adkins - The Website Subscription Model(JulyUP 2018)".